Want to see the package everybody is talking about? Sure – there are hundreds of different models of speakers with many different features to choose from these days – but if you’re looking for something that simply does the job and sounds great doing so then consider a pair of passive 15’s with an amp. Why? Many will say that passive speakers produce better sound quality and that by having a separate amplifier you take control over your PA system – this is why most venues will use passive speakers over active. Don’t just take our word for it – visit a store and hear for yourself. 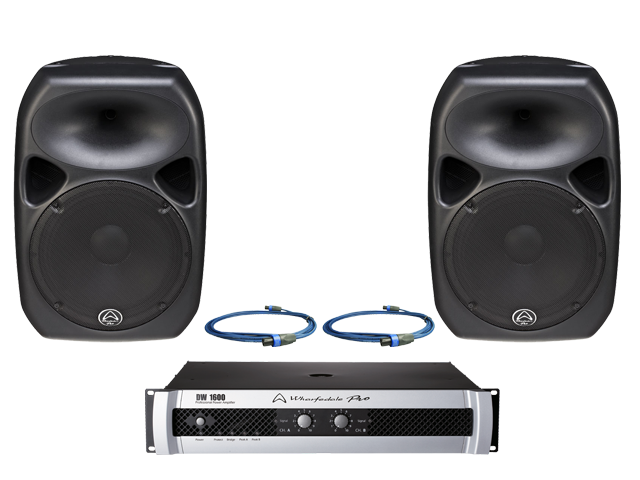 Here’s a package boasting a peak power of 1600w using two Wharfedale passive TITAN15’s and an amp to match. With a combined retail of $2,000 and a price point matching the active speaker equivalent, this is an opportunity to pick up a quality professional speaker set up that will serve you for years at a bargain price. Want one? Buy now or visit your nearest store! Give your next event the X-FACTOR with Antari’s Z1520 Vertical Fogger!Passive or Active Speakers – What is best for me?